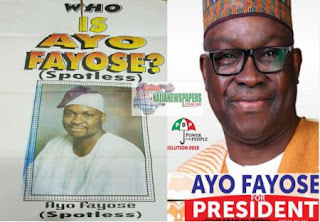 Ayodele Fayose grew up in Oyo State where he attended Olivet Baptist High School, Oyo In 1985. Fayose was admitted for a Higher National Diploma (HND) programme in Biological Sciences/Applied Medical/Biology by The Polytechnic, Ibadan and graduated in 1987. Fayose became the second governor of Ekiti on 29 May 2003 after defeating the then incumbent Governor Niyi Adebayo in the governorship elections. Fayose could not complete his tenure as a result of an impeachment on 16 October 2006. During the 2014 Governorship election in Ekiti State, Peter Ayodele Fayose was again the PDP nominee. He won the election and was declared by the Independent National Electoral Commission as the new Governor of Ekiti State; he was inaugurated on 16 Oct 2014. Fayose is now the only Nigerian to defeat an incumbent two times. Though he is a sitting governor, Fayose is the only person from the mail opposition party in Nigeria to have publicly declared his intentions to run for president in Nigerian general election, 2019. Though his party, Peoples Democratic Party, PDP, has admonished the Governor, against his ambition to be the party’s presidential candidate in 2019. 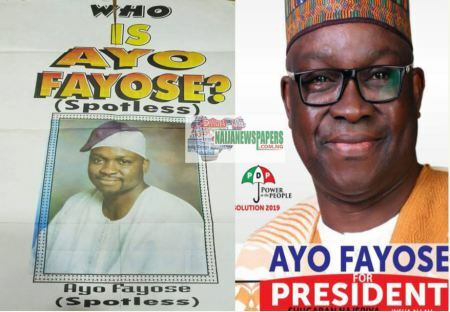 Fayose on his facebook page posted his first ever poster right when he was 39 years. “This is how Governor Ayo Fayose’s political journey in Ekiti state started in 1999.